Students will be able to show what they have learned about the geologic history of earth. The purpose of lesson is to finish the movie, assess student understanding of the geologic basics we've learned and give students some exemplars for the timeline project. Exemplars - Exemplars help students get ideas on projects that push them forward. Stop and Go film - Stopping the film often gives the students a chance to discuss, predict, take notes and identify important terms. Learning Goal: Discover some of the important events in early man's history. Opening Question: What do you remember about human life BEFORE civilization? Students record their opening question on their learning goal sheet and are ready to start class 3 min after the bell has rung. I reward students who get started early with ROCK STAR SCIENTIST tickets. In my district, the social studies curriculum starts with the concept of civilization and pre-civilization. This is a great chance for me to connect the huge amount of evolutionary history we are examining to the very small about of recorded human history they are studying in Social Studies. The students are always awed and surprised at how small a space human history takes up. Today, I ask students to remember as a table some of the things we learned about life before civilization. We share out answers and talk as a class about the connections we might see in the film today. Follow the links to learn more about the beginning of class strategies and ROCK STAR scientist tickets. For the hook today, I am doing a focus lesson for the timeline project using exemplars. I want to show students some different examples to give them some ideas for their timelines. See screencast below. I show the movie in short 13-20 min sections. I stop the film often to have students record notes on major events using a note catcher. I also use notes that are already made for students with slow processing or writing difficulties. 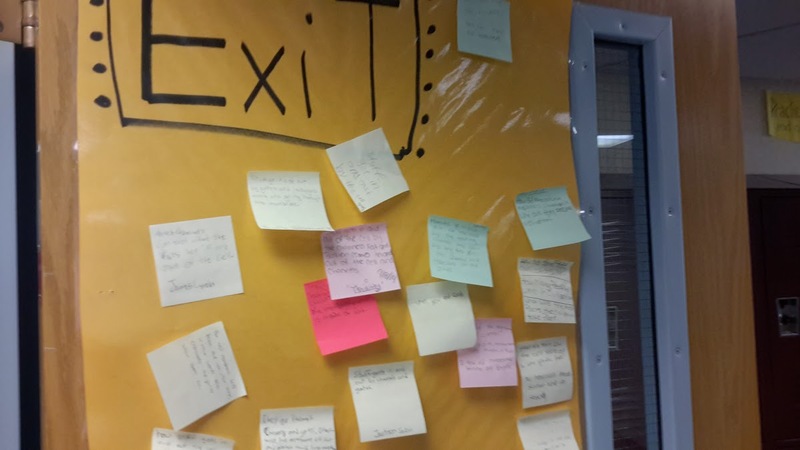 These modified notes make it possible for all students to complete the final project. As we watch the movie, not only do I stop to talk about content but I also stop to point out important vocabulary words. Students record these vocabulary words in their TIP (Term- Information- Picture) charts. Today I show the last section of the movie The Story of Earth, from 1:18:48 to 1:29:47. This section contains information about early hominids and the future of earth. The purpose of this section is to assess students on their understanding of Geological Timelines, Geological layers, and the History of Earth. I wrote this test with one of my coaches and evaluators. We took out a couple of the multiple choice questions to make more room for constructed response and raise the DOK level of the questions. Depth of Knowledge (DOK) is a method of adding complexity to questions and activities. 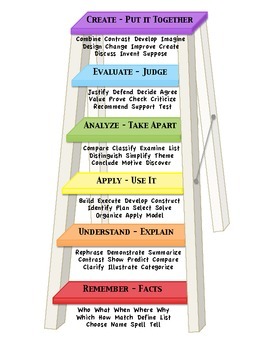 Like Bloom's taxonomy, it has levels of complexity going from easy to difficult. Some criticisms Blooms are that it is too easy to write questions using the verbs that are still low level. Unlike Blooms taxonomy, DOK focuses on the complexity of the tasks the students are completing. When we looked at the first test I had written, most of the questions fell in the level 1 or Recall area. To fix this we took a few of the multiple choice questions and bumped up the complexity using DOK sentence starters, turning them into more open ended questions. This is one of the questions that we adjusted. Using the timeline and your knowledge how would you describe the change in life from the beginning of earth to the present day? Because the question asks for students to apply their knowledge and use evidence from the timeline, this is a Level 3 question. Previously, the question was level 1 because it simply offered the students choices about how life developed. This adjustment to the questions did have consequences. Students scored terribly on the higher level questions! The next step for my teaching will be working with my coach to put higher complexity questions into my teaching all the time so that the students and I both know the level they are learning at. When students have completed their tests they should work on their timelines. Closing Statement: For the last week we have been watching a movie about the history of Earth. We seen a number of important geological and biological events. Closing Question: Which events did you think were the most important for Earth's history and why? Closure depends greatly on timing and is not as easy to plan in advance as opening. You can find more information about how I manage closure here.